The effort resulted from Toyota’s 20-year partnership with the California Science Center, intended to raise space program awareness and understanding through exhibits and related events. The shuttle took a 12-mile route through the streets of LA to the display site at the California Science Center that included crossing the 405 Freeway. The Tundra was required for the transport of the Endeavour across the Manchester Boulevard Bridge, where a lighter tow mechanism was needed for the purpose of weight distribution. Toyota and the Sarens Group completed extensive testing to develop a dolly to carry the Endeavour over the bridge. The Sarens Group is an experienced heavy lifting and engineering transport company. “We’ve partnered with the California Science Center since the early '90s as part of our ongoing commitment to inspiring youth in the fields of engineering, innovation and future technology, and we are honored to lend our support for this historic event,” said Michael Rouse, vice president of community affairs and philanthropy for Toyota. The 2012 Tundra CrewMax 4x4 with Toyota’s 5.7-liter iForce V8, producing 381 horsepower was picked for the job. The truck used to tow the Endeavour was purchased from a Southern California Toyota dealer, exactly like what any customer would buy if he selected this exact model. All Tundra trucks are fabricated at Toyota Motor Manufacturing, Texas in San Antonio. The historic mission was piloted by seasoned Toyota professional driver Matt McBride. Riding along was Garrett Reisman, an astronaut who rode the orbiter to the International Space Station in 2008. Just five immortal minutes from beginning to end was consumed taking the Endeavor across the bridge. On of the Science Center’s displays consists of a working exhibit that uses a Tundra to demonstrates the physics of leverage. 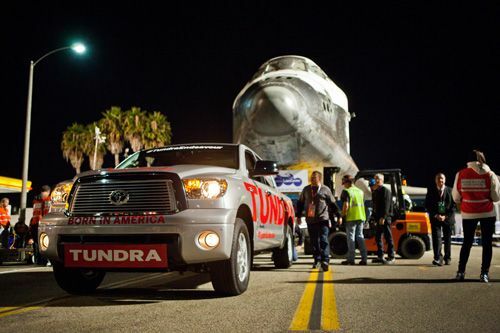 The Tundra used to tow the shuttle last night will replace that truck when the Endeavour exhibit oapens on Oct. 30. You might say it was one short ride for the Endeavor, but one giant haul for the Toyota Tundra.